One of the reasons I love having long hair is that it covers the huge wart on my head. I love the versatility of long hair. And I am always on the lookout for new looks. At a recent street fair, I found a vendor selling these. She gave me a quick lesson on this new (to me) hair decoration, and once I got home I was able to use it easily in a couple of different ways. The double combs were sold as an easy-on-the-hair way to elegantly put one's hair back. And, as she demonstrated, they work on short hair, too. Click to see a demo video on how to use. And they do work. I can put easily put my hair up for an anniversary celebration with my husband (13 years this week!). I can turn the double comb into a ponytail for a quick trip to the gym. Or I can just pull my hair back and up to keep it off my neck in the gawdawful Boston humidity (we are at the in-laws as I type). 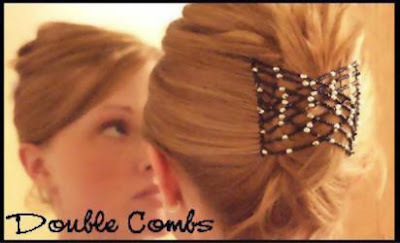 The double comb is easy to use, versatile, and it comes in many designs. Thumbs are up on everything except for price. The sticker price on the street was $15. I dickered (love that word) down to $12, which is the price I found for you at Amazon. I plan to wear mine at the BlogHer conference. Now I need to find some new clothes, too. What does one wear in San Francisco in July? Uggs and a parka? now I just gotta get me one of them passes! That hair thing is fascinating, cuz I'm always looking for ways to pull my hair up that don't look lazy. And that looks too fancy to look lazy. So I think to the conference, you should wear the combs, and legwarmers. What you put in between is up to you, but legwarmers for SURE! Luna -- the main party isn't in a conference room, it's gonna be in one of our hotel rooms! You'll be included, don't you worry. Chicklet -- you gave me a new post idea. Snicker. Remember, I was in college in the prime leg-warmer era, AND I am a packrat. These are actually knockoffs of the HairZing. Their site, if you check it out, has a much better demonstration and video of how to work their hair thingies. Thanks, anonymous. Maybe readers will like checking out hairzing as well.